Caught about 15 with this being the largest to date. F1 21 months since stocking they were approximately 1 inch when stocked. Thoughts? Very nice LMB for 21 months old where did you get the fingerlings? At this point keep an eye on the amount of forage available for these bass. We need to have a good way for pondowners to "measure the amount of forage that is available". Lusk and other professionals what say you??? Your original stocker bass will be eating and needing a tremendous amount of fish biomass to keep the growth rate at the current pace. The other option is to reduce the number of bass per acre to ease up on the total predation amount to maintain the stocker's fast growth. I suggest that you record the length of every one you catch to track their growth rate. IMO they should grow another 2"-3" maybe 4" this year if food is adequate and another 2"-3" next year. Keep us advised of your pond progress. If your bass are not hitting that growth mark then you have too few forage fish or too many predators. Bill the fingerlings came from Southeastern Pond Management in Canton MS. I was told not to keep any until the third summer which will be next summer! The other ones I caught were in the 1-1.5 range. I'm new at this so any advise is appreciated! Whether you keep any bass really depends on your forage base. If it is healthy and producing lots more fish and forage numbers seem to be abundant then SPM is correct, don't keep any of the original bass. But knowing if the forage base is adequate or even optimum is a key and important part of the 'equation'. Since you are fairly new here and if you are truly intent on growing big, great bass, as I know the management, to determine if the bass have enough food,,,, take length and weight measurements of each bass you catch. Record the data. Then check to see if they are mathematically plump. Do this with the Rw formula where it says to take the bass weight and divide it by the standard weight of the same length of bass. Rw (relative weight) is also called Wr. (I always convert everything to ounces for my calculations; remember that 0.8 lbs is 12.8 oz not 8oz). Then multiply the answer by 100 or in ewest's example below use % (.92). Fat well fed bass have Rw value of 85+, better is 90+, and 100+ is very, very good - fatty bass. When the value for that fish drops below 85 or 80 toward 70 that bass is not getting enough to eat- meaning forage items are in short supply and or there are too many bass compared to numbers of forage. Note that female bass during spawning will always appear fat, but the plumpness is egg mass not true body mass i.e. 'fat'. Spawned out females will appear thin bodied and have a low Rw. Be aware of when you are taking your Rw samples compared to spawning season. All this is similar to monitoring the BMI (body mass index) of yourself or family members to determine their plumpness. But for healthy family members you want a lower value, however for your bass you want them tubby to even obese with a high Rw value. Please come back periodically and update us as to how your F1 bass are growing and their plumpness as determined by Rw (Wr) values. Pictures of your F1 bass are always nice for members to see. There are various tables of numbers here on the forum that give you the standard weight of LMbass. 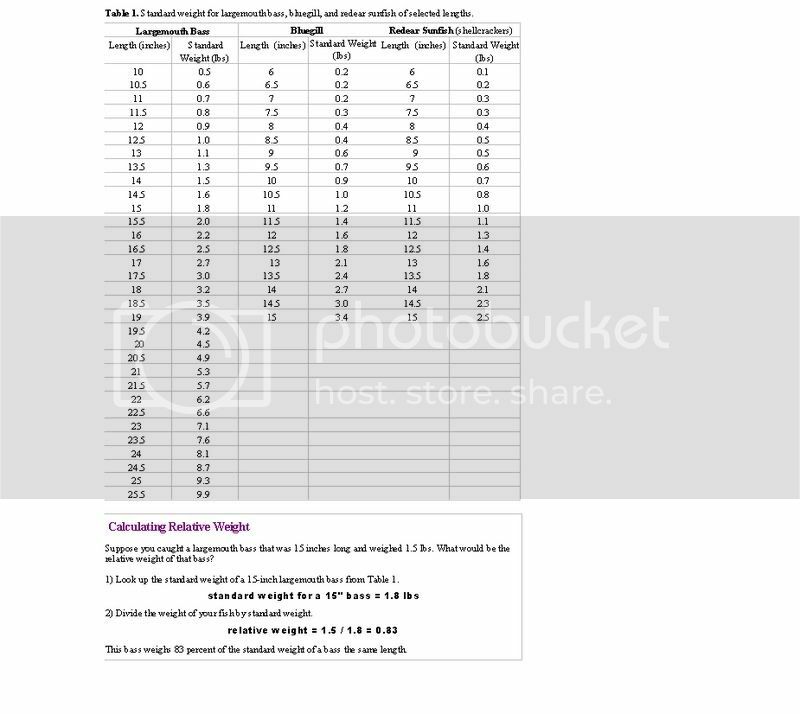 I found some information of standard weight of LMbass. Interesting to see that RES grow faster until about 8.5 inches, then BG takes the lead. Assuming reasonably good conditions, how long would it take to reach that length for each fish? By the way, is the term BG here indicative of CNBG? RES and BG growth to 8"-8.5" in good habitat conditions could take as little as 2 often 3 years. In some situations they may very rarely grow to the 8.5" mark. Generally here on the forum, BG are not the same as CNBG. Most regular members know the difference and do not interchange the two acronyms. When in doubt ask the poster which strain they are referring to. To some people all sunfish are BG - reader beware. Nice LMB. That first year of growth can be tremendous. They are eating machines those first couple of years and the growth, provided enough forage, reflects this. Actually many LMB are eating machines their entire life, it is just many water bodies especially smaller ones have limited amounts of the proper numbers and sizes of food for the bass as they grow past the 3-4 lb range, thus the bass seem to slow down quite a bit in growth as they get larger. Not necessarily. Midsize LMbass may show slowed growth in length, but if continually properly fed, these older trophy bound bass are adding annually the same amount of extra body mass in terms of girth compared to the length-weight added as younger individuals. In ponds, it is often too many medium-large bass per acre are over eating the food base to maintain the best growth possible for all the large bass. Bruce Condello is proving this in his Nebraska quarry by hand feeding some bass all they can eat daily. Two types of bass condition factor in this thread. After a few years of proper feeding these bass grew to this. See the thread for two examples. For a pond about 2 acres, About how many do I need to weigh and measure to get a good estimate? If it were my pond, I would weigh and measure some every year at about the same time of year, for example end of May to mid June and or in September. Then the year to year data will be most comparable. Or if you are really dedicated measure a few every month or whenever you are fishing. Weighting and measuring does take a little extra time and puts a little extra stress on the fish. I would collect your samples from various parts of the pond not primarily from one section of the 2 ac pond. How many to measure is up to you and the general sizes and numbers that you are catching. Generally the more often you fish the pond the less you will catch the bigger or biggest bass due to them becoming hook smart/shy after they have been exposed to frequent angling episodes. Frequent angling (angling pressure) usually results the average size of bass caught becoming less as the life span increases of older bass. Thus your younger, less, hook shy bass are more likely to bite artificial baits and these are the ones that you catch or sample most often. After a few years you will not catch one of the biggest bass every time or anytime you go fishing. You will not be able to go out and sample all sizes any time you choose. As the pond ages, the bass are not cattle or chickens in a pen to select a certain group for sampling. So IMO your weighing and measuring should be done whenever you are able to catch one or a few of the midsize and larger bass. Thus fish sampling by angling does have its limitations compared to other ways to sample fish for example electroshocking. The only way to be able to consistently catch by angling all sizes of bass each time you go fishing is to not make your fish hook smart/shy. How to do this is discussed in the archives under the topic of Hook Smart Bass which is about 1/2 way down the thread. Body condition factor will change for adult bass depending on season. Food availability and body weight can change throughout the year. Once your original stocker bass become old fish and die you will not have a good idea how old the bass is from just measuring the length. Thus measuring the fish's weight lets you know if it is getting enough food for good growth which is indicated by how plump is it is out of spawning season. The LMB pictured is in good condition. Keep plenty of food (forage and or pellets)available.